READI (Retired Employees Are Dedicated Individuals) was founded in 1993 by retiring Oscar Mayer employees who wanted to make a difference in the community and still work and socialize with fellow employees. READI is now part of United Way of Dane County and is open to all interested individuals in Dane County. 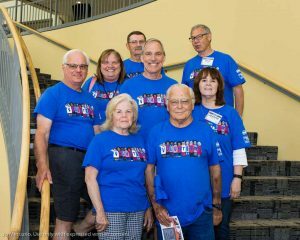 READI’s mission is to enrich the quality of life in local communities through retiree volunteer involvement, build quality relationships within our communities, and to provide retirees an opportunity for camaraderie. READI’s objectives are to help our Dane County neighbors in need, serve our community, leverage in-kind support, and to socialize with our fellow volunteers. 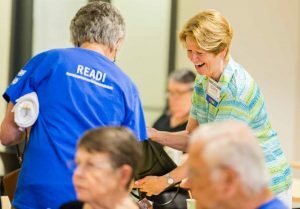 Over the years, READI volunteers have contributed over 5,000 hours on approximately 50 projects each year (over 125,000 total hours in 20 years). READI currently has over 260 members. READI volunteers participate monthly at the Second Harvest and Saint Vincent de Paul food pantries. READI volunteers also lend their skills at onetime events such as Berbee Derby, Race for the Cure, Brat Fest, IRONMAN and Light the Night, among others. There are project opportunities for everyone regardless of physical restraints, age or work experience. Activities include: mass mailings, prairie burning and seed planting for Dane County Parks, stuffing and handing out bags for various run/walks, receiving food donations for various runs/walks, and many more. Are you READI to volunteer? We hope you will join us as a volunteer and share your time and talents, develop new skills, and meet new people while serving the community. Sign up as a READI Volunteer today by sending an email to READI@uwdc.org or call at 246-4350 extension 4399. You will receive monthly newsletters and a calendar about volunteer opportunities for all skill levels. To learn about the history, mission and impact of READI, read the READI brochure HERE. Visit us at facebook.com/readimadison for photos of our volunteers in action! Below you will find a link to upcoming READI volunteer projects. Click on the title of the project you are interested in to see its details and coordinator contact information. We will see you there! Would your organization like to request READI volunteers? Please fill out this Volunteer Request Form and return it to Debbie Steinmetz dksteinmetz@charter.net. Each month, READI publishes a newsletter that highlights the volunteering activities that happened during the past month, upcoming projects, and special announcements. Click on the button below to read the most recent newsletters!